Can a player cast instants after revealing them from their hand? Love this recipe! 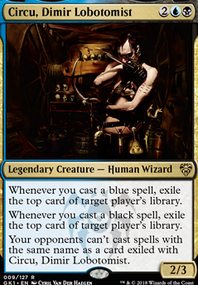 Of course the removal is up to you, but I would also consider Blackmail , and at 5$ a piece you could consider Inquisition of Kozilek . 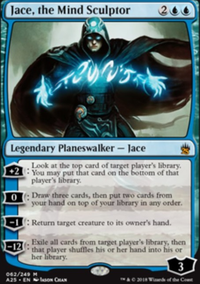 I love Davriel because he can cover that turn three with a great -1 and a rack effect built in. If anything I would scale back on a few of your "racks" (12 is a lot) for more removal or discard. You could also look into Necrogen Mists and Funeral Charm . Yeah thats a bit of a flex spot for now, maybe Blackmail is a better option here?? Was thinking WM was going to be that last ditch effort to empty oponents hand so they rely on top deck but ehhh its not rrallt that strong here. Could even exchange WM for Dreadbore ?? Well done, I had been also trying to do jund land destruction usinging the algae and urborg, my deck was called "urborg algea" and it consisted of similar, be it budget cards like Marshdrinker Giant . At the time, BB Elf was banned and collective brutality wasn't printed, so I was also running Stone Rain , Goblin Dark-Dwellers , and Blackmail (because it hits lands), fatal push also didnt exist, so my deck ran mostly terminate and Bolt for removal, other than that it was pretty similar. 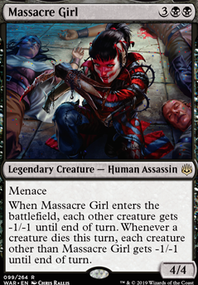 Megrim, just isn't that efficient, if you want the Megrim effect I'd suggest Liliana's Caress as there is a big difference between two mana and three. 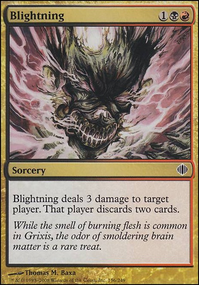 Mind Rot, his a similar issue, I'd suggest Tasigur's Cruelty or Delirium Skeins as an alternative. 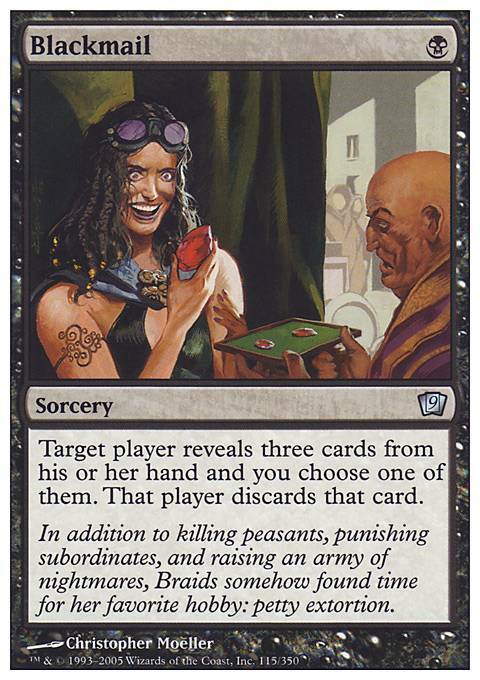 I also rather like Blackmail and Mire's Toll in discard decks, since both have the ability to hit lands. 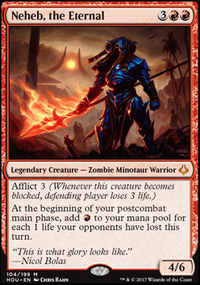 An alternative finisher might help too; Torment of Hailfire or Rakdos's Return would potentially fit. Norn's Annex isn't Ensnaring Bridge but it could fill a similar role, even at the cost of 4 life it probably saves you more than that in damage. Hope this is of some help, good luck brewing your deck. I'd cut 2x Sovereign's Bite and 2x Blackmail for 4 more lands. Preferably swamps. Liliana's Caress is a strictly better Megrim, since it costs 1 less to cast. Augur of Skulls (2 cards), Pilfering Imp (evasion / repeatable), Black Cat (random) and Rotting Rats (2 shots) are better discard creatures, however if you want to keep the rat theme you should run Pack Rat. 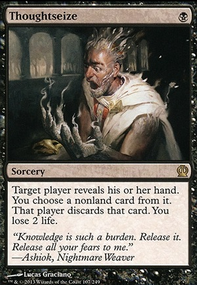 Inquisition of Kozilek, Blackmail, Mire's Toll and Vicious Rumors are solid additions, better than Despise / Duress. Funeral Charm is one of the few ways to force discard at instant speed. legendofa on mtg hologram duels? I've thought about this idea myself. The problem I keep thinking of is how to display effects that don't really have a physical representation, like Curiosity or Blackmail. Also, something like Sickening Shoal or Dismember would get pretty graphic. It's a fun idea, and a computer with enough memory and processing power might be developed in the next few decades, but the execution would take as much work as anything else. @QKey Thanks for the suggestions Lotus Petal is great but does a lot less if I draw it after the first turns, same goes for Elvish Spirit Guide. The usual dork on the other hand can be cycled through Skullclamp, and will help in the event I cast [Armageddon]. I even ran a version with no dorks and hand disruption instead, including Blackmail and the others. I decided to have a more aggressive build considering I also have a Grixis deck. We'll see how this one goes.